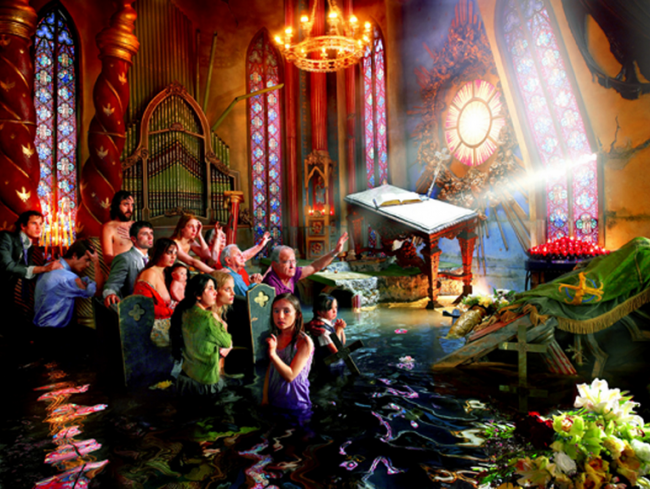 Cathedral by David LaChapelle marks the artist’s transition from commercial photography and return to his roots of fine art photography. Cathedral by David LaChapelle is inspired by the biblical narrative of the great flood. Human faces are trapped within the confines of cathedral as flood waters quickly rise. Their souls seek salvation but it does not seem likely. Even though disaster is upon them the subjects appear calm. The criticism of some of the values consecrated in contemporary society—the addiction to fast food, the worship of anorexic models of beauty, and their destructive encounter—are conveyed via references to Pop and Surrealism, rather than by means of the original. LaChapelle, as an important documenter of Pop culture infuses universal values of religion and morality with entirely new meanings. Cathedral from the Deluge series is about the craziness of being faced with danger, with imminent death, when every material thing is taken away. You have to find some sort of enlightenment when everything you value suddenly becomes worthless. Michelangelo’s Deluge in the Sistine Chapel shows humanity at its best, people helping each other. With Michelangelo we have the idea that physical perfection equals divinity. When LaChapelle put out an ad on Craigslist enlisting Angelinos to pose for his photographs, the artist quickly realized that what worked for Michelangelo wasn’t going to apply in the same way to contemporary photography. A subject in a photograph just means something completely different than a subject in a painting.